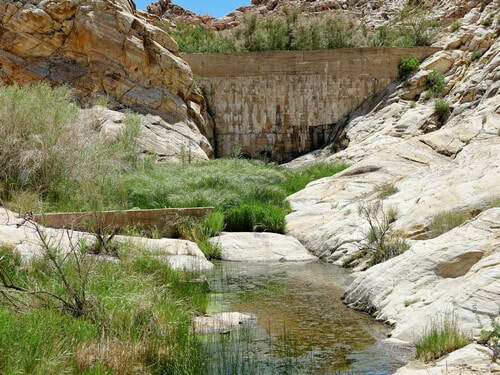 See the actual Bitter Springs that so many things in the area are named for, dip your toes in the water of Buffington Pockets and scramble behind an old concrete dam to see a large petroglyph panel, all while enjoying great scenery. 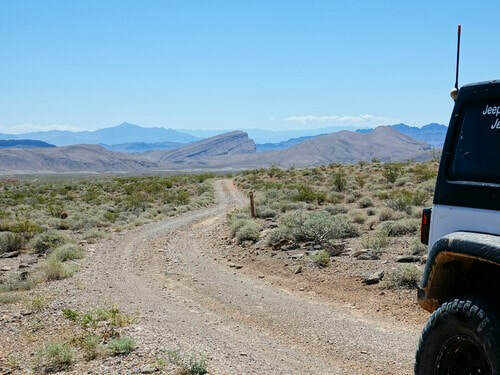 Bitter Springs Trail is a BLM Backcountry Byway. The route is 26 miles and will take most people around 3 hours, depending on how much exploring is done. We did the run from east to west so the sun would be at our backs, but it can be done in either direction. It is described from east to west. 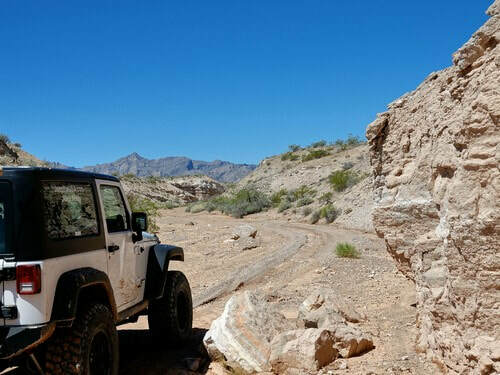 The trail begins by going down Echo Wash, where Bitter Springs is located. 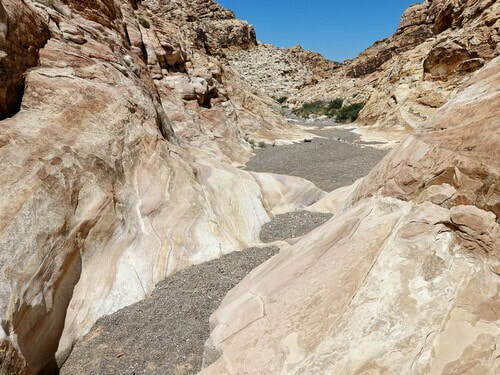 There is a distinct canyon at the start but you soon emerge into the wide Bitter Springs Valley. Leave the valley by passing this prominent, but unnamed, butte and skirting the bottom of West Longwell Ridge. Leave West Longwell Ridge and head northwest toward White Basin. 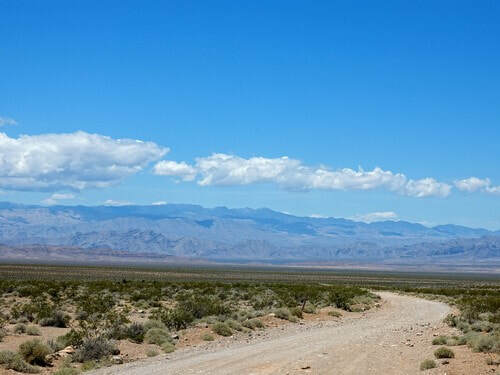 You will be driving on what was the American Borax Road. 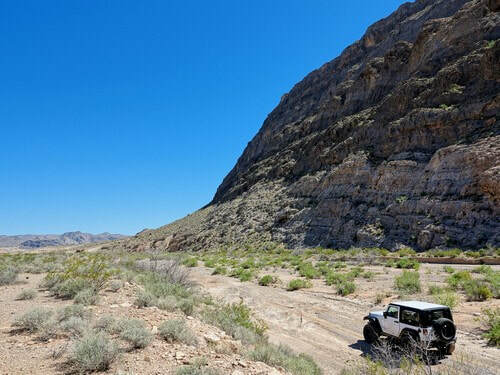 American Borax Company had a mine in this area. 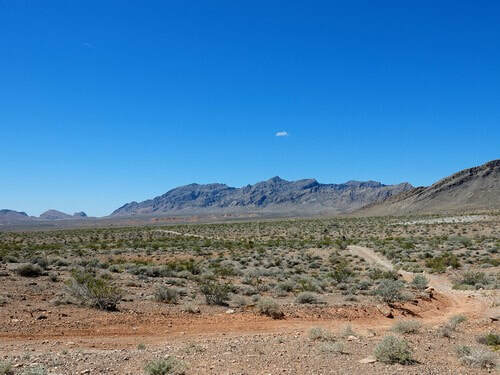 White Basin is 7 - 8 miles across without many items of special interest; however, the panoramic view of mountains makes it very enjoyable. We stopped in the middle of it and looked in both directions. Climb out of White Basin and cross over a height of land. 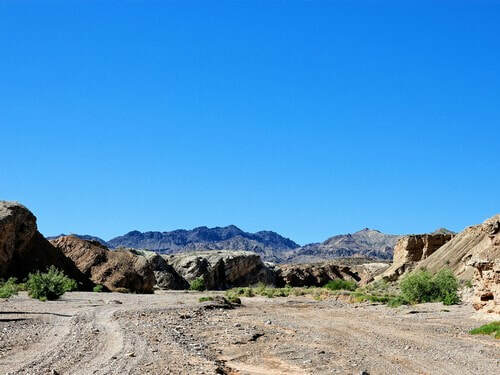 The landscape undergoes a dramatic change from "typical" desert to a wonderland of colored and sculptured sandstone. 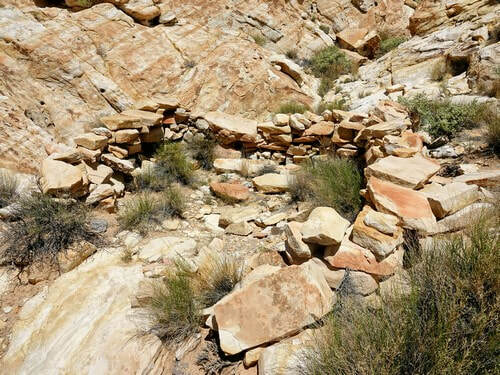 Buffington Pockets is an area where Jurassic-aged Aztec Sandstone is exposed in a dramatic contrast to surrounding land. Water has percolated through this sandstone and leached out the deep red coloring. What remains are the soft pastels of tans, oranges, and maroons. 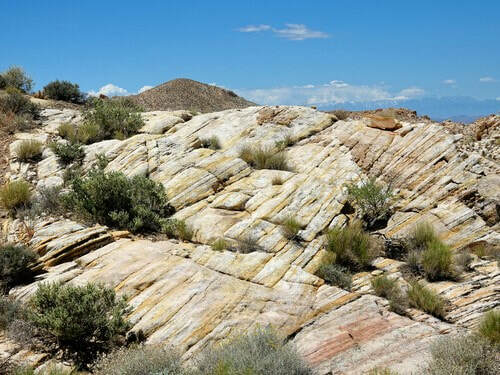 Aztec Sandstone is composed of ancient eolian (wind blown) sand dunes which have lithified into sandstone. The dunes moved as the winds removed sand from the windward side. Loose sand flows over the dune crest and slides down the leeward side, forming inclined layers called cross bedding. As dunes merge and shift, a patchwork of cross bedding is created. Info from a geocache. These pockets collect runoff and hold it for long periods of time. 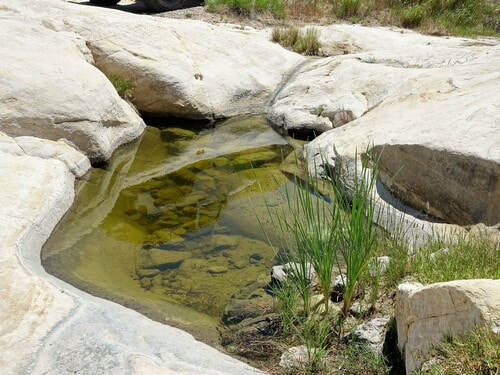 This water has been important to humans, and wildlife, for centuries. A concrete dam was used as a bigger pocket a number of years ago. The area behind the dam has filled in with gravel almost to the top of the dam. 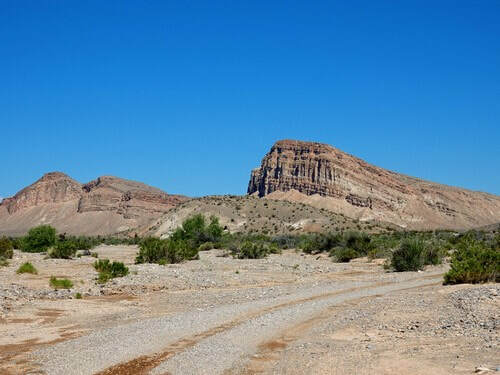 Make an easy scramble up the side of the dam and walk up the wash for less than a quarter mile. 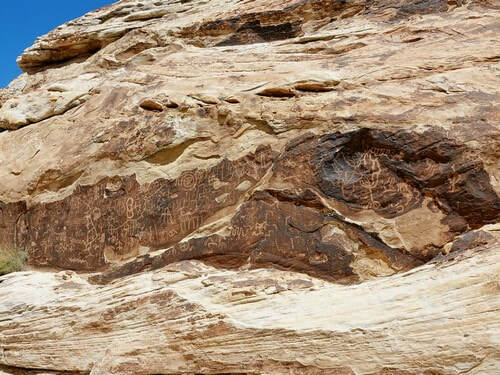 You will find the remains of a stone structure and a fairly large petroglyph panel. 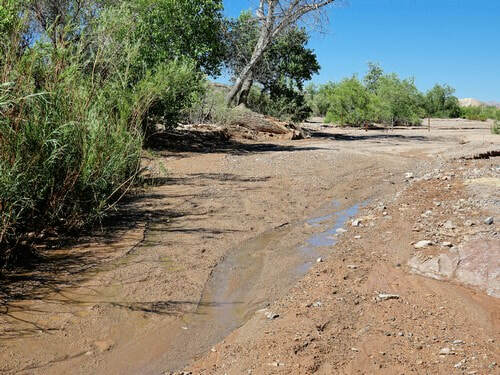 The wash behind the dam is easy to walk, as shown in this photo. 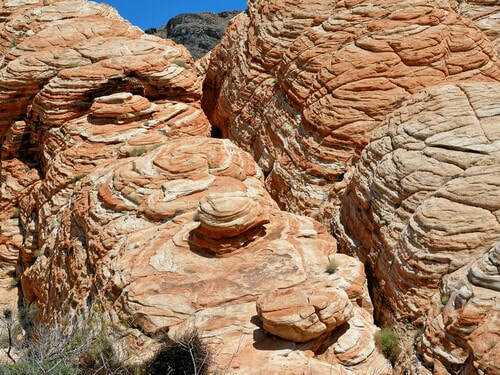 Continue on the road and cross wide California Wash on your way to I-15.